It was July 2, 1976 when Marilyn Abrams and Bruce Jordan met in Lake George, New York to start rehearsals for I Do I Do!, little knowing in that Bicentennial year, that they would begin a friendship and business partnership that thrives to this day. They shared a love of hard work and a good fun and went on to appear together in Private Lives, Broadway Bound, and Same Time, Next Year. They met frequently in New York where they both made the inevitable actor rounds. One night over a drink, Bruce suggested they take a stab at turning a serious participatory German play called Scherenschnitt, into a comedy. Being actors, they relished the idea of the roles, Tony Whitcomb, the flambuoyant hairdresser for Bruce, and Barbara de Marco, the enigmatic manicurist for Marilyn. They were off and running with it by the summer of 1978. Along the way, they renamed it Shear Madness and opened a rough version in Lake George. Despite many flaws, the audiences were ecstatic and, heady with success, the duo played it a second summer and then headed to Boston for a pre New York City tryout. The intent was to run for 8 weeks, make back their investment and take it off Broadway. Reality struck when they failed to recoup, but the intrepid pair soldiered on and made a momentous decision when they were advised to close Shear Madness in May as no theatres stayed open in Boston during the summer. “Great!” they said simultaneously, “We’ll be the only show in town.” That August they made their first profit and have never turned back. They rehearsed and rehearsed, sold the tickets, lassoed in the groups, and as the New York Times said, “Shear Madness is as much a part of Boston as Yastremski and the Boston Pops.” The show still plays at the Charles Playhouse after 38 years. A n offer they couldn’t refuse came in 1981 from the Bellevue Stratford Hotel in Philadelphia that needed a good laugh after the legionnaires disease debacle. Abrams and Jordan replaced themselves in Boston and moved to that bastion of liberty and then to Chicago growing their little fiefdom to a three city entity. Washington, DC at the Kennedy Center followed and their company Cranberry Productions (what else do you put on a turkey) added more staff, and more productions. Offers poured in from theatre companies all over the world to produce the show. From that small start, the number of productions thus far stands at 115 with 28 foreign language translations. Much to the astonishment of the original co creators, Shear Madness has earned the distinction of becoming the First, Second and Third (Boston, Washington, D.C, Chicago) longest running plays in American theatre history. Still a lot of hard work…still a lot of fun. of madcap improvisation and spine-tickling mystery. This unique comedy-whodunit takes place today in the Shear Madness hairstyling salon and is chock full of up-to-the-minute spontaneous humor. During the course of the action, a murder is committed and the audience gets to spot the clues, question the suspects, and solve the funniest mystery in the annals of crime. The outcome is never the same, which is why many audience members return again and again to the scene of the mayhem. 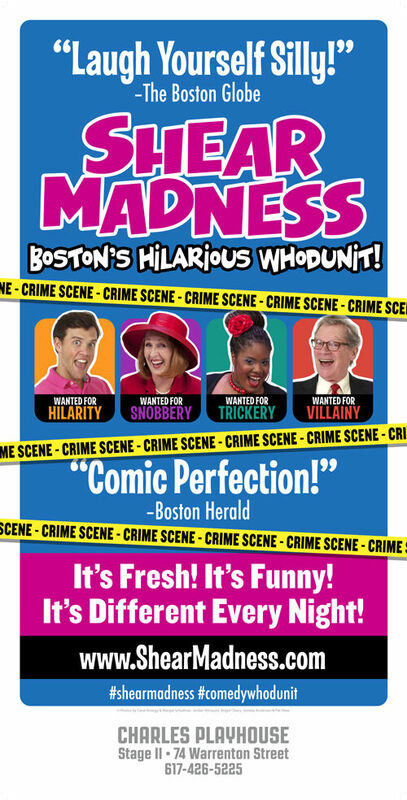 Voted "Best Comedy of the Year" seven times by the Boston Globe and recipient of the title "Best Play of the Year" by both the Chicago Sun-Times and the Philadelphia Enquirer, Shear Madness has also received the Raven Award from the Mystery Writers of America and has been inducted into the Comedy Hall of Fame, the first play ever to receive that accolade. 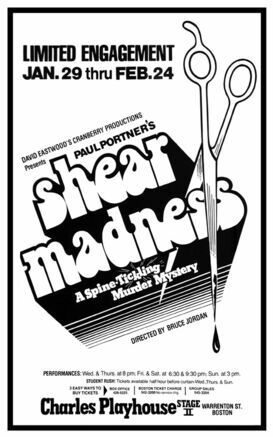 The flagship Boston company has given birth to 50 productions in the U.S. and Shear Madness has been translated into 23 foreign languages, playing worldwide in a host of cities including Barcelona, Buenos Aires, Madrid, Paris, Rejkavik, Rome, Tel Aviv, Melbourne, Johannesburg and Seoul. Over 12.5 million people worldwide have joined in the fun. Shear Madness is listed in the Guinness Book of World Records as the longest running play in the history of the USA. 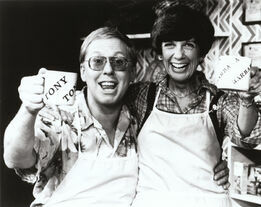 Bruce Jordan and Marilyn Abrams take on the roles of Tony Whitcomb and Barbara DeMarco on stage. The Record Breaking Comedy Whodunit! Recommended for children over the age of 13, but all ages are welcome. There is some innuendo, but it is all in good fun.